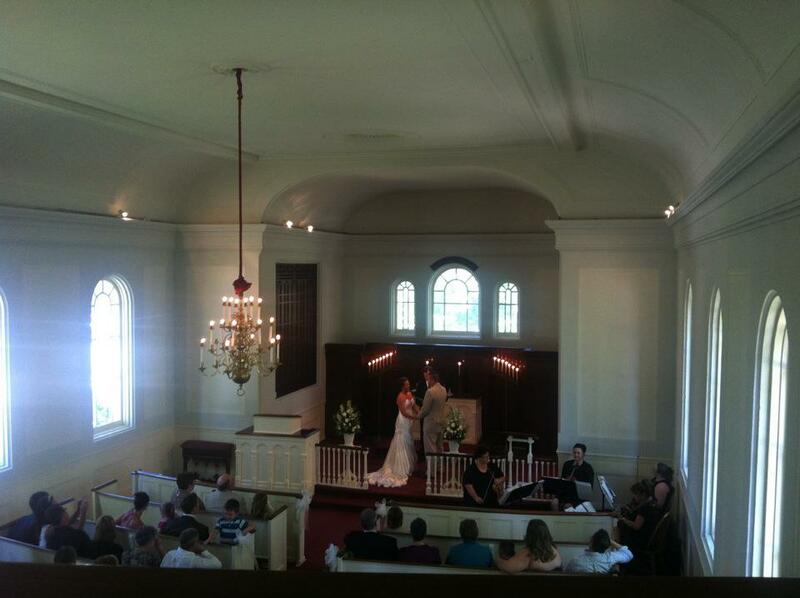 Congratulations to Stacy and Tim who were married recently at the Mary and Martha Chapel of Greenfield Village. At the head and highest spot in Greenfield Village, Henry Ford built this chapel in 1929. 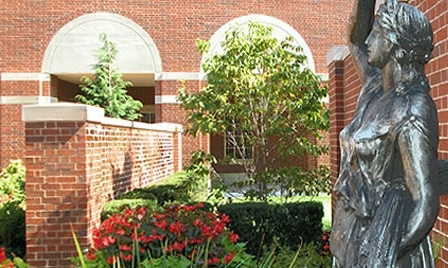 The chapel is one of six non-denominational chapels built around the country as a tribute to Mr. & Mrs. Ford’s mothers, Martha Bryant & Mary Litogot Ford. Adam Reilly of Beacon Baptist Church officiated the ceremony and did a beautiful job incorporating Tim’s son and daughter into the special day. The couple chose all contemporary music including Lady Gaga, Coldplay, The Verve, Katy Perry and more. The families processed to “Candle on the Water”, a song made famous in the Disney movie Pete’s Dragon. In a touching moment, Stacy and Tim involved their children in the sand unity ceremony while we played “Rainbow Connection”. It was a beautiful day at the Village made even more so by the creation of a new family. We wish Stacy, Tim and their children the very best as they begin their lives together. Congratulations to Chelsey and Donnie who were married last week in the Ginger Meyer Garden at Lovett Hall, part of the Henry Ford campus. It was a beautiful day for an outdoor wedding and as always, the staff at Henry Ford does a fantastic job of preparing for an elegant event. Our thanks go out to them for their help with cues and all the ways they assist us. Chelsey’s mother, Kim, was a pleasure to work with throughout the planning. It was obvious that she was delighted with Donnie becoming a part of the family. The large bridal party walked to Jesu, Joy of Man’s Desiring. Chelsey, wearing a gorgeous gown, processed to the famous Pachelbel Canon escorted by her two brothers. Following the ceremony, the guests enjoyed cocktails inside Lovett Hall. We had the pleasure of playing for the cocktail hour and the classical music made an appropriate background to the classic elegance of Lovett Hall. Best wishes to Donnie and Chelsey as they begin their lives together. Congratulations to Erlene and Joseph who celebrated the joining of their lives with family and friends in the Anderson Theater of the Henry Ford Museum. Outdoor weddings are always risky with weather being an unpredictable variable. 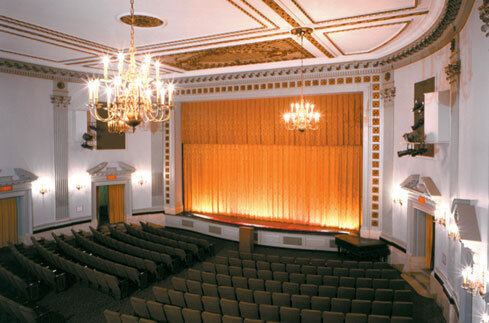 Erlene and Joseph had originally intended for the ceremony to take place in the Pennsylvania Courtyard but wisely chose to move the ceremony to the Anderson Theater as rain threatened. Nevertheless, the ceremony was beautiful and incorporated traditions from Joseph’s Jewish heritage and Erlene’s Filipino heritage. Both Rabbi Nadia and Father Jim officiated the ceremony and explained the meaning behind their respective traditions. The Jewish Chuppah or wedding canopy created an intimate, sanctified space symbolizing the home that the bride and groom will share together. The Filipino Coin Ceremony symbolizes the couple’s commitment to their relationship, children and community. On this day, the coins they used were the same coins used when Erlene’s parents were married. The ceremony concluded with the Jewish tradition of the breaking of the glass. A broken glass cannot be mended. Likewise, marriage is irrevocable. Family and friends shouted “Mazel Tov” as the newly wedded couple recessed to the Finale from Handel’s Watermusic. Following the ceremony, appetizers were served in the main hall while we of play hits from the Beatles, MoTown, Coldplay and others. Congratulations to Erlene and Joseph as they begin married life together. Congratulations to Katelyn and Douglas on their elegant wedding in Lovett Hall at the Henry Ford in Dearborn. The maid of honor and bride descended the gorgeous red carpeted staircase to St. Anthony’s Chorale by Haydn. Brothers of the groom, Scott and Christopher, each did an excellent job with the readings. The celebratory and upbeat ceremony was officiated by Rev. Robert Amor with his wife, Michele, coordinating the ceremony. Following the ceremony, coctails were served upstairs in the elegant 1930’s Lovett Hall Ballroom while the Rondo String Quartet played more contemporary music by the Beatles and Journey to name just a few. 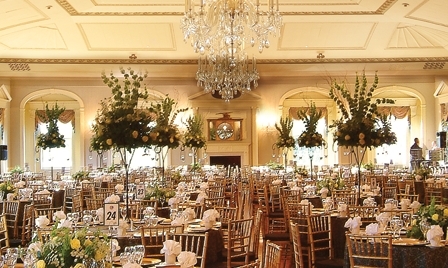 Dinner followed in the glamorous setting of the 1930’s ballroom. The evening had a classic elegance with a touch of vintage glamour. We wish Katelyn and Douglas all the best as they begin their married life togther.